October 25, 2014 ~ Craig M.
Source: Wikipedia. 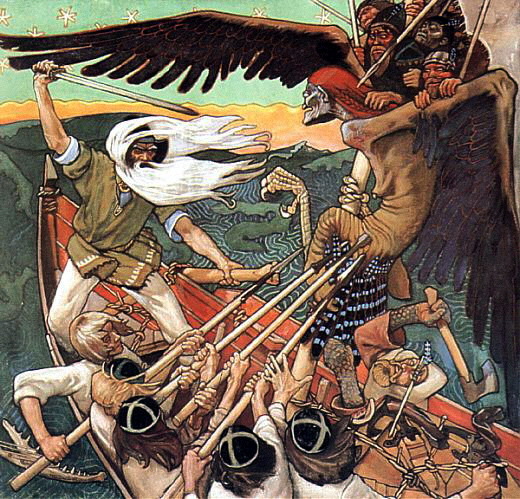 “The Defense of the Sampo” [a magical item in the Kalevala], by Akseli Gallen-Kallela. Tonight and tomorrow (Oct. 25 and 26), Rent Romus will be presenting a new, jazz-sounding project with some deep personal ties. “The Otherworld Cycle” is a suite honoring his Finnish roots. It’s based in part on the Kalevala, an epic of Finnish antiquity that tells the creation legend and other grand myths. I’ve never heard of it before, but it’s massive and, well, truly epic. a culmination of over 14 years of research into intersection between modern composition, improvisation, and Finno-Ugrian traditions in music. The Other World thematic abstractly reference the Uralic “Body of Memory” embedded in Romus’ musical psyche refracted through the multi-faceted lens of improvisation and postmodern jazz. In addition to basses, saxophones, and drums, these performances will include some guest players and some traditional instruments: overtone flutes and a kantele (kind of a Finnish zither). The shows are Oct. 25 at 8:00 p.m. and Oct. 26 at 3:00 p.m., both at the Community Music Center (544 Capp St., San Francisco).